Drawn from the popular stage show and podcast, The Thrilling Adventure Hour is a collection of original tales that harkens back to the heyday of genre entertainment. 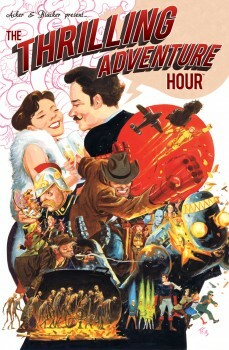 Written by TAHcreators Ben Acker and Ben Blacker, this 136–page hardcover anthology features ten new stories from the worlds of the Thrilling Adventure Hour. Brought to life by top artists from the comics community, each stand–alone tale celebrates and reinvigorates a different classic genre, including science fiction, fantasy, westerns, superheroes, horror, war dramas, and many more. A unique, timey–wimey blend of silver age pulp and post–modern pop, this one–of–a–kind anthology promises something for everyone as this cult phenomenon jumps off the stage, out of your earbuds, and onto the page for the first time!